Pack ‘n Play Playard with Cuddle Cove Rocking Seat is more than just a playard. It’s a combination of essentials that every parent and baby needs for their comfort. You can put your baby in it to rest, to play or to nap. It is comfortable and safe. It is definitely worth the money. Lots of additional features make it be cozy for your child and convenient for you. This set has a changing table. You won`t have to waste space at your home by locating a massive changing table there. To make the process of changing diapers even more convenient, there is a special organizer with cubbyholes for everything that you might need. Pack ‘n Play Playard with Cuddle Cove Rocking Seat is not something that you will need to get rid of just a few months after purchase. At the very beginning, you will use the rocking seat and the changing table, and as your baby will turn into an infant, you can switch to using the bassinet. As soon as your child becomes a toddler, the playard will become a perfect spot for spending time in a fun, but safe way, while you are dealing with errands. This product is not only great for having fun and entertaining your baby. It is also very convenient for the times when you need to calm your baby down, or when it is time to have a nap. To make it easier for you, both the rocking seat and the playard bassinet have a built-in vibration. Melodies are a great way to distract and entertain your baby, while you are busy. Luckily, Graco thought about it! There are five musical melodies and five fun sounds to choose from. It is not a problem to keep the environment around your baby clean with this item. It is covered with a material that can be washed in a washing machine. It includes a playard, a rocking seat and a changing table. A canopy for the rocking seat is a part of a set too. Electronic module provides gentle vibration, five melodies and five sounds. The main part is made of plastic. It requires 4 Nonstandard batteries. Its dimensions are 28.5 x 50 x 33.2 inches. Customers who have used this product point out how convenient and advantageous it is thanks to its various features. Mothers praise the vibration mode, as it helps babies fall asleep with comfort. Fathers say it is much easier to keep their babies entertained, when the melodies are on. Some clients had issues with setting the playard up, but the manual is included, and there are also quite a few tutorial videos online that you can use if you have any trouble yourself. Overall, most people say that it is a good quality product for a reasonable price. 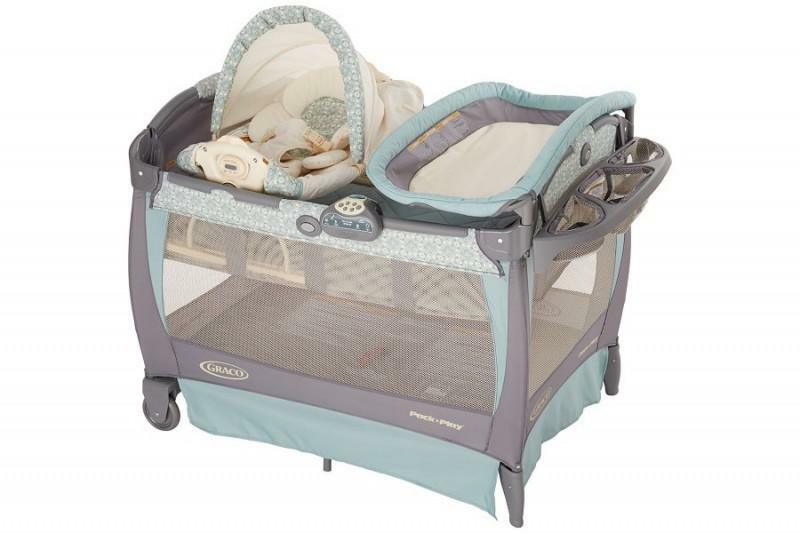 Who Should Buy Graco Pack ‘n Play Playard with Cuddle Cove Rocking Seat? It will be a good choice for parents who prefer to spend both their money and home space wisely. It is a set that will suit couples who are expecting newborns, but do not want to make too many purchases. Your baby can listen to musical melodies, while you are changing a diaper, and you can turn the vibration mode when the time to nap comes thanks to the functionality of this product. Q: Where can I find the Manual? A: You can find it in a pocket at the bottom of the playard. Q: Is it complicated to pack it if we want to travel with it? A: No, it is not. Even though the set has a few devices, everything is quite light, and you can pack it without any difficulties. Q: Does it have a toybar?